Facebook is among more than 100 companies that gathered May 19-20 with utilities, developers, service providers and non-governmental organizations at the 2016 Renewable Energy Buyers Alliance Summit at Microsoft’s Redmond, Washington, headquarters. The two-day interactive conference focused on accelerating the fast-growing market for utility-scale corporate renewable energy. WRI’s new Corporate Renewable Energy Strategy Map shows companies where they can buy affordable renewable power at the scale they need from their local utility supplier. 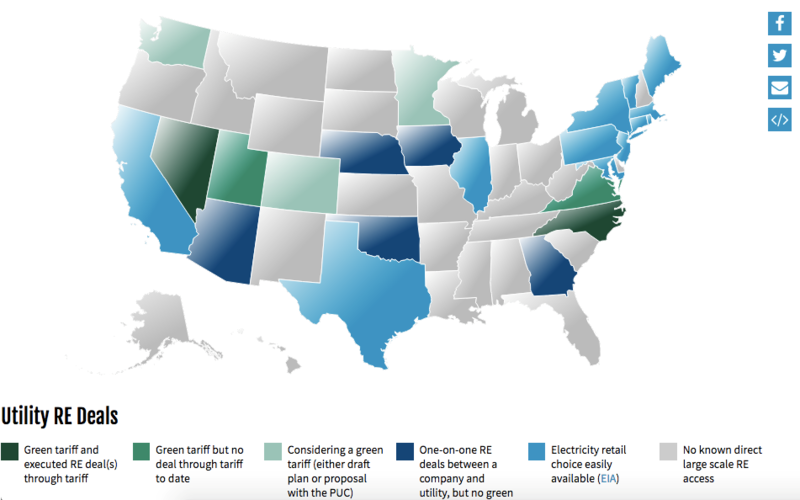 This interactive map lets companies compare renewable power options in various states as they decide where to put new U.S. facilities or expand existing ones. It highlights green tariff programs and other utility energy products that let customers meet their clean energy goals and lower electricity costs. Michigan is one state on the verge of offering competitive renewable energy options to its largest customers. When Switch, a growing data center company, chose to build a data center near Grand Rapids, the company wanted renewable energy to be part of the power mix. Switch is collaborating with the local utility, Consumers Energy, to develop a pathway for sourcing renewable energy at a reasonable price. According to a recent article, the data center will bring $5 billion of investment to Michigan. Right now, Michigan is gray on the map, with no functional direct access to large-scale renewable energy. (Michigan’s renewable energy access is so over-subscribed that it prevents companies from joining now.) But if this transaction goes through, Michigan would be part of a growing list of green states on the map. Companies that want renewable energy must navigate a patchwork of state utility regulation in the United States. 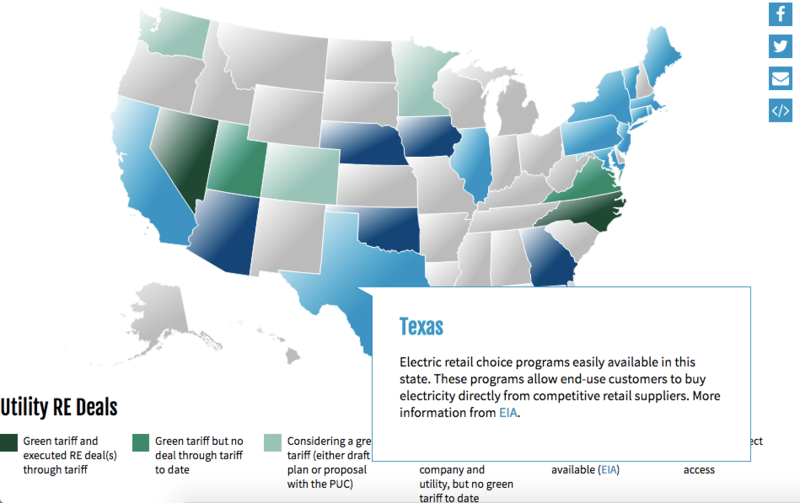 The Corporate Renewable Strategy Map provides an overview of the U.S. electricity system, highlighting the growing number of states where utilities are creating better solutions for large-scale clean energy buyers. Updated as new utility products emerge, the map shows how these innovations are spreading across the country. It relates each option to the six Corporate Renewable Energy Buyers Principles so that customers can easily understand what options exist where and how closely these options might fit their needs. If companies want to replace some or all of the traditionally-fueled electricity they buy from their utility with renewable energy such as wind and solar power -- and they want the renewable energy certificates (RECs) that match that electricity -- they have a few choices. If the corporate facility is in a state with retail choice - a state where customers can choose their electricity supplier - the company can find a provider that offers renewable energy directly. This is exactly what Facebook did in the summer of 2015 in announcing its new data center in Fort Worth, Texas. Retail choice is relatively uncommon, so most customers must buy from their local utility, with little say in how the power they use is generated. In a growing number of states, though, utilities are responding to the customers demand for more renewable energy. In Iowa, for example, Mid-American offered a one-off deal for Facebook and Google, while in Arizona, Arizona Public Service signed renewable energy agreements with IO and eBay. These deals all allow customers to bring new renewable energy to the regional grid and credibly claim using it. The map tracks those emerging deals so customers can easily see what other customers have arranged. The utility may also offer an off-the-shelf product that brings together the fixed price of renewables with the RECs. Because renewable energy has no fuel cost, the price of energy from the projects is predictable over the long-term. 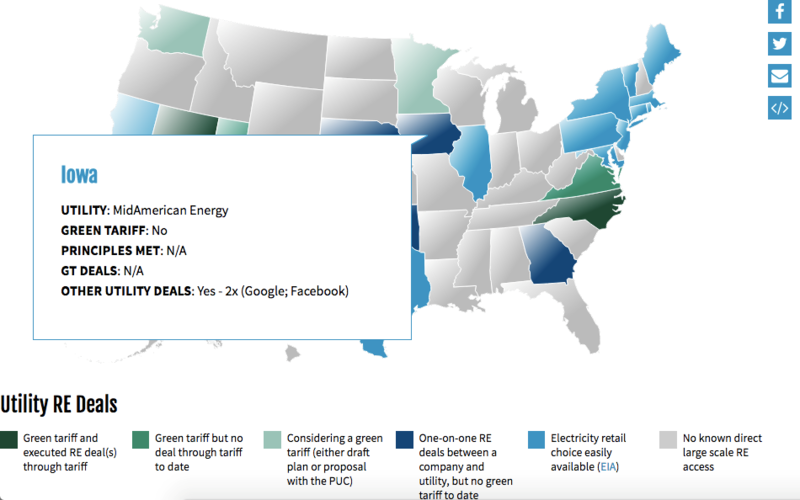 These utility products are called green tariffs and have emerged in a handful of states. Green tariffs are mechanisms for large corporate buyers to source local renewable energy through the grid. Apple, Switch and the City of Las Vegas have successfully used them in Nevada, as Google has in North Carolina. In Minnesota, the local utility, Xcel Energy, has created this kind of product, which is currently being reviewed by the state's regulatory commission. The map shows customers where those opportunities are emerging. 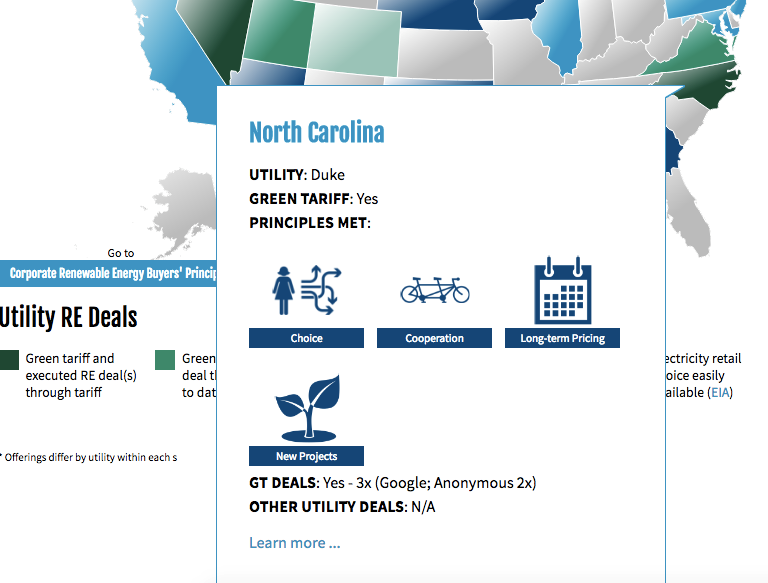 The map also offers utilities an easy way to explore how other utilities are successfully offering new renewable energy products. In this evolving landscape, WRI is closely monitoring progress and updating the map regularly. As Switch and the other nearly 60 companies that participate in the Renewable Energy Buyers Alliance (REBA) network demonstrate, offering a compelling renewable energy option is becoming crucial to attracting the largest, iconic brands to a community.